The District Attorney’s Office would like to inform all parish merchants and individuals about of a free service we offer to help you collect on NSF and/or ACCOUNT CLOSED checks. The issuance of these checks is against the law. The District Attorney’s Office can help to collect and/or prosecute individuals who present checks as a form of payment for services rendered or merchandise received. Click here to download a Request to File a Charge. Please read the following instructions for assistance with this free service. Checks must be dated the same day they’re given. Post-dated checks are not prosecutable. Do Not accept checks previously signed. Have them signed in your presence and compare with the driver’s license or other I.D. Require a permanent street address, not a P.O. Box number, unless you know the check writer. Every kind of I.D. can be forged. The most reliable are the ones with physical descriptions, photos, etc. If you are suspicious, ask the writer to hand you the license and while it’s in your hand, ask his address and /or date of birth. If it is not his license, he may be caught off guard and give the wrong information. Do written amounts and numbers correspond? Banks will not honor checks with discrepancies. Is the I.D. used recorded? Record on the check the type of I.D. and I.D. numbers as well as the clerk’s initials who takes the check. It is very important to get a driver’s license number. The check must be presented to the bank for payment, even if you know it will not be honored, and stamped by the bank as to the reason for dishonorment. 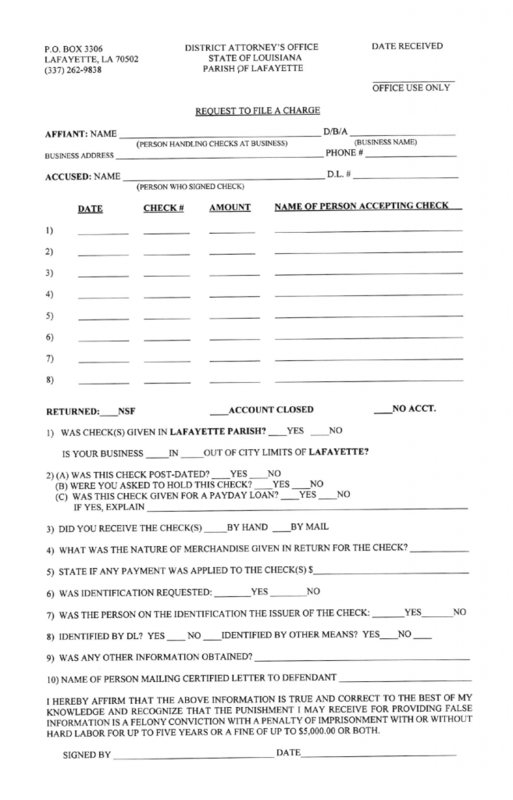 If the check is returned insufficient funds, you must send written notification to the check writer informing him or her of the reason the check was not honored. The written notice must be sent certified, return receipt requested. The sample letter attached sets out the information which must be included. If it is a company check, the letter must be addressed to the person who signed the check. This is why it is important that the signature is legible. If you cannot read the signature, ask for the name and driver’s license of the signer. If the check is returned account closed, no letter is required. If the check is stamped nsf and account closed, a certified letter is required. The signed receipt from the certified letter or the correspondence (unopened) marked refused or unclaimed. When you bring in a check, it will be logged and a search made to see if the maker has any other worthless check offense pending. If there is, yours may be combined with the one previously filed. If not, the office usually notifies the writer that a case is about to be filed against him. If he does not make restitution, prosecution procedures will be started. The Worthless Check Fee Act was passed by the Legislature to defray some of the prosecution expense and require the worthless check writer to help bear the cost of his misdeed. Because of the worthless check fee, it may cost the issuer up to double the amount of the check. After filing, there could be additional expenses of a fine and court costs. When any monies are collected, we will send you a check from our office. If you move or your business closes, please notify us immediately with an address so we may forward any restitution collected. Once the check has been turned over to us, you should not accept any monies for payment of the check. You need to advise the check writer to contact our office. Hopefully, this explains the importance of your role in getting the necessary information to enable this office to control the worthless check problem and get you the restitution you deserve. If you have any questions or problems, please contact my staff or me. We will be glad to help in any way. marked insufficient funds (or other reason marked on the check by the bank). You have ten (10) days from the date of this letter to bring payment in cash, cashier’s check, or money order for the total amount of $000.00 or this matter will be turned over t o the District Attorney’s Office for prosecution.